The Colorado Supreme Court on Monday overturned a lower court’s decision that said the Colorado Oil and Gas Conservation Commission was required to weigh the impact of oil and gas development on public health and the environment in deciding whether to approve new drilling permits and rules pertaining to the oil and gas industry in Colorado. DENVER – The Colorado Supreme Court on Monday overturned a lower court’s decision that said the Colorado Oil and Gas Conservation Commission was required to weigh the impact of oil and gas development on public health and the environment in deciding whether to approve new drilling permits and rules pertaining to the oil and gas industry in Colorado. Colorado Supreme Court Justice Richard Gabriel wrote the unanimous 7-0 decision that was released Monday, which found that the COGCC “properly declined to engage in rulemaking to consider a rule” proposed in 2013 by Xiuhtezcatl Martinez and a group of Boulder teenagers. The COGCC said in 2014 that approving such a rule would have been beyond the authority it was granted by the Colorado General Assembly when the commission was created. The teens and a host of environmental advocacy groups appealed to the Denver District Court, which sided against the teens and advocates. But the COGCC, American Petroleum Institute and the Colorado Petroleum Association petitioned to the Colorado Supreme Court , with then-Attorney General Cynthia Coffman arguing state law and earlier Supreme Court decisions were being overridden—despite an objection from then-Gov. John Hickenlooper. In their appeal to the state’s high court , the COGCC and oil companies argued that the COGCC didn’t have the authority to do what the petitioners were asking and that the COGCC was already working with the Colorado Department of Public Health and Environment to address the same concerns the petitioners were worried over. But in the Supreme Court’s decision, Gabriel reversed the appeals court’s decision and said the COGCC “properly declined to engage” in rulemaking with the teenagers and environmental groups. The court listed three reasons as to why it made its decision. It said that courts had a “limited and highly deferential” role in an agency’s decision whether to engage in rulemaking with various parties and secondly, that the COGCC “could not properly adopt the rule” proposed by the teenagers. The Supreme Court’s ruling comes amid a fierce battle between environmental groups, some Front Range communities and the oil and gas industry over new oil and gas development in Colorado. Two separate ballot measures were voted down by Colorado voters in November – one backed by environmental groups that would have increased setbacks for new development and one backed by the oil and gas industry that would have required the state to compensate property owners for any laws that would have reduced their property value. He said that he would continue to put the state on a path toward 100 percent renewable energy by 2040, but also said he wouldn’t leave the state’s oil and gas workers behind in adapting the state’s energy sources. After the Supreme Court’s decision was released Monday, the oil and gas industry called the decision a positive development, while environmental groups said that the state was still kowtowing to the interests of the industry rather than the interests of Coloradans and the environment here. “Today’s outcome is positive for all Coloradans. The court was right to deny a single out-of-state interest group – one that advocates for ending all energy development across the country – the ability to rewrite our state’s laws,” Colorado Petroleum Council Executive Director Tracee Bentley said in a statement, calling environmentalists’ agenda “extreme” and claiming that a ruling in their favor would have cost the state money and jobs. 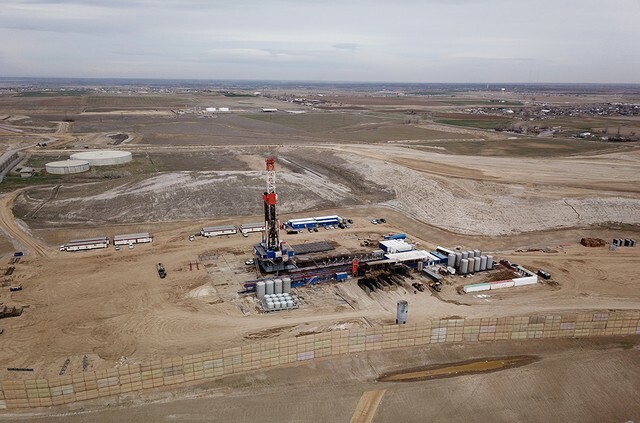 “We are confident in Colorado’s energy future and the ability of the Colorado natural gas and oil industry’s ability to continue to reshape the global energy balance, fueling an American manufacturing revival and leading the world in environmental progress,” Bentley added. Though one of the primary attorneys for the respondents in the case was from Oregon-based Wild Earth Advocates, the other attorneys were both based in Boulder, and attorneys for a host of government, private citizens and environmental groups who filed amicus curiae briefs in the case were also from Colorado. Colorado Rising, the group behind the setbacks measure which was defeated in November and which has already petitioned Polis for a new measure, slammed the court’s decision Monday. Sen. Mike Foote, a Lafayette Democrat who has been among the most vocal lawmakers when it comes to pushing back against the oil and gas industry, said in a statement that he saw the decision as an opportunity for the General Assembly to make fixes itself to the COGCC. Democrats now control the state House and Senate, as well as the governor’s office, and have the opportunity to pass whatever they can get their full caucus to agree on without Republican support, though they have pledged to pass bipartisan bills. House Speaker KC Becker said the court's ruling "puts the decision back into the hands of lawmakers to take action and we are committed to addressing this concern this legislative session."